As is often the case in the brutal world of tennis, a veteran rises and falls (again). Flavia Pennetta stood at the baseline and bounced the ball with her racket, reaching slightly as it almost skipped away. Across the net, her opponent, Maria Sharapova, was slowing her down — fiddling with her strings, rocking on her feet, thumping her thigh with her fist. 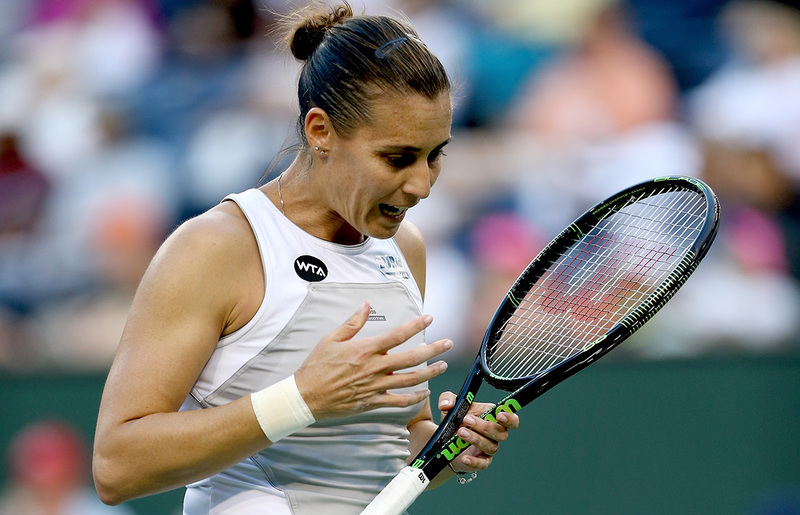 Pennetta breathed deeply, deliberately, hollowing her cheeks and filling her chest. Suddenly, something was wrong. Distress flickered across her face, furrowing her brow. She took a breath, paused, tossed up the ball, and rocketed it into the net, a double fault. She threw back her head, grimacing, and called for another ball. It should have been nothing. She had lost millions of points in her life, hit thousands and thousands of double faults. The match on Tuesday was only just beginning. She and Sharapova were on serve in the fourth round at the BNP Paribas Open, three games in. But the air around her shifted. “Then it’s coming,” Pennetta would later say in her lilting Italian voice, “like I never expect.” What was it? It was hard for her to say. A tightness in her chest; an awareness of where she was. She won the next two points, but it was too late. She was trying to breathe. Her eyes, edged with liner, were bright with tears. A Sharapova backhand hit the top of the net and skipped over to Pennetta’s side, giving Sharapova the game and the break. Pennetta wiped her face with a towel and stepped in to return, puffing her cheeks and pursing her lips. She could not hold back the tears. Last year, the tournament at Indian Wells had been a dream. No one seeded as low as Pennetta — 20th — had ever won the tournament. She hadn’t expected to change that, or even to come close. The BNP Paribas Open is on the tier just below the four majors: the winner takes home nearly $1 million; it features the top players — both men and women; it is so significant that it’s called the fifth slam. Once, Pennetta had been a relevant contender, the first woman from Italy to make the top 10. But that was more than half a decade ago. She is no longer even the top player in Italy. In 2012, she’d had wrist surgery so serious that it kept her out for six months and nearly ended her career. In 2013, she was so miserable that she thought seriously about retiring. But in 2014, in the California desert, she had a magical run. She seemed delighted to be on the court; she seemed to have fun. She even announced that she was dating fellow Italian player Fabio Fognini by tweeting a picture of them in bed together. And as it happened, she won the 2014 title. This year, she’d had a solid tournament so far — better, certainly, than she might have feared. In her first four tournaments of 2015, she’d won two matches in a row only once. There would be no shame in losing to Maria Sharapova, the second-best player in the world. But Pennetta was the defending champion. With a solid, steady, intelligent game and a particularly good cross-court backhand, she matched up well against Sharapova, who was struggling herself, getting only about a third of her first serves in play during the first set. Pennetta broke back — before breaking down again. Sharapova won the set, almost as an afterthought. Pennetta was clearly in some kind of crisis. She looked up, over, around. Tiers of seats rose up all around her; people stared down. Her instinct, she would later say, was to disappear. There was nowhere for her to go. At the end of the first set, she took a bathroom break. In the hall, she went to pieces. In her press conference afterward, Pennetta was asked about the tears. What had happened? Was everything all right in her personal life? “Sì, sì,” she answered. “I’m really happy.” She couldn’t explain it. It had come upon her unaware, like the hot wind that blows across the Southern California desert through the mountain passes. The pressure. Like all tennis players — save a few — she’d become expert at losing. Nothing had prepared her for the weight of having once won. In the locker room, during the bathroom break after the first set, she cried and screamed, she “let everything out.” Then she came back on the court and beat Maria Sharapova, 3-6, 6-3, 6-2. Which only earned her the right to have to come back out on Thursday to try to win again. Flavia Pennetta is 33 years old. She has been a professional tennis player for 15 years. She has won 10 singles titles (Indian Wells, of course, being the biggest). She is enough of a celebrity in Italy for her romantic life to be considered newsworthy. She is rich, with $10 million in career earnings. By the standards of all but the tiniest handful of players, she has had a very successful professional tennis career. And as a very successful professional tennis player, coming into Indian Wells she had lost 350 times. Only one player can win any title, and only a few — in any generation — win many. To survive, a player has to accustom herself to losing. Which doesn’t make it easy. Tennis players are competitive. They fight, sometimes desperately. They throw themselves into shots, dive on concrete, rip ligaments chasing a ball. They do not always accept defeat as an inevitability. They throw rackets. They curse and rage. They bring themselves so close. They lose by a handful of points. But there it is — losing is the way of the sport. It’s difficult to wrap your head around this, especially for Americans, I think, who tend to reward only winners, and yet demand a certain level of egalitarianism in sports. Or at least, it’s hard for me to wrap my head around. The lack of parity in tennis, the idea that only those who win slams are successful, is one reason we tend to think there are only five or six tennis players who exist, let alone players who count. But of course it affects those players, too. They hate losing and yet losing also becomes something they know. It’s one of the reasons the sport is so brutal, so psychological, so lonely. They have to accept a certain amount of cynicism. They have to credit their self-doubt. At some point, hard work and determination and talent run out. It is more difficult, of course, because tennis players are out there on the court by themselves. They cannot be traded to a better team. They cannot play a role. They cannot hide their mistakes. They cannot hide at all. And when they do become champions — when draws break their way, when they clip the lines instead of just missing them — they sometimes find that winning can be just as hard as losing. It hits them — maybe only for a point, or a game, or a match. Sometimes they can do what Pennetta did and find a release, reset, relax. Sometimes they can’t. At this year’s Australian Open, Simona Halep, ranked third in the world, lost to Ekaterina Makarova in the quarterfinals, 6-4, 6-0 — looking like she wanted to run off the court. Marion Bartoli won Wimbledon in 2013, lost her next match in Cincinnati, and, in tears, promptly retired. Petra Kvitova won Wimbledon in 2011, displaying so much talent that it seemed almost certain she’d become no. 1. Except for another brilliant run on the grass, though, she has struggled to string wins together. Her talent hasn’t gone anywhere. Nor has her desire. But when it comes — the tightness, the pressure, the emotion, that indescribable bewilderment — her game deserts her. It’s so unusual for a man outside the Big Four to win a major or a Masters that they rarely even have the chance to shrink from the spotlight. So tennis players have to learn to measure themselves by other standards. They talk about process, about practice, about goals. And you believe them, for the most part. But sometimes there’s a tremor. Sometimes there are expectations. Sometimes it — whatever it is — becomes too much. Pennetta has a wonderful game, balanced and aggressive, with a particularly powerful backhand. She can play with touch and power, angles and depth. But at some point she runs into a wall. Then she collects herself and runs at the wall once more. In the quarterfinals last night, Pennetta faced Sabine Lisicki, who’d once made a Wimbledon final but more often struggled. It was the first time they’d met. Pennetta was a little hesitant at the start of the match, getting a feel for Lisicki’s style, pushed back by Lisicki’s heavy shots. Pennetta lost the first set and very nearly the second, staving off a match point with an incredible backhand and going on to win a tiebreak. In the third set, both players were aggressive, trying to drive the ball through the court. The shots grew harder as the hours passed and the evening crowd swelled. Up 5-4, Pennetta attacked the German’s serve, earning two match points. But Lisicki fired two huge serves. There was not much Pennetta could do. The wind was picking up. The air was getting cooler, denser, as it does at night in the desert. Only hours before, the dry mountains ringing the desert tennis garden — perfectly planned, watered into lushness — had seemed like scenery, spurs and hillocks painted onto the pale blue wall we called the sky. But the wind out there has an edge. The day before, there’d been a sandstorm. Not far away there’d been thunder and dry lightning, then a sudden burst of rain. Pennetta lost the third-set tiebreak and the match. Afterward, she seemed subdued. The lines around her mouth were cut deep. She was happy with how she’d played, she said. It had been a few points here, a few points there. She shrugged. That was the sport. She’d done what she could. And she’d lost.